Social media is the latest cultural “bad boy.” Like rock’n roll before it, social media is being blamed by critics for corrupting the youth of America. These same critics say that social media has no place in the nation’s classrooms. Educators such as Dean Shareski, David Jakes, and Carolyn Foote disagree. They say that social media belongs in school, and that social media can improve the quality of education being given to students and make them more engaged in the process. Carolyn Foote is a tech-centric librarian at Westlake High School in Austin, Texas (and another recent Tech Forum Texas speaker). She writes about her school’s iPad 1:1 rollout and its impact on library services on her blog at www.futura.edublogs.org. Foote has seen firsthand how much students can learn using social media, and how many options they have for doing so. This said, neither Foote, Jakes, nor Shareski are advocating a “wide open” approach to social media at school. All three of them see a need for some level of control by teachers and school over Web access. In truth, the appropriate use of social media in schools goes much further than creating ‘rules of where you can surf.’ It comes down to educators grasping social media as a new form of learning—both for researching and collaborating more effectively. To do this, educators themselves have to become personally familiar with social media, just as they had to personally embrace computers not so long ago. 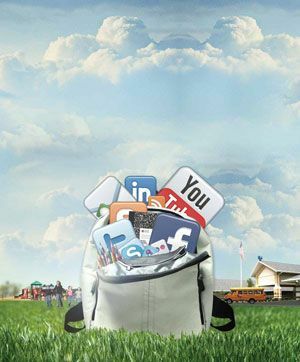 The reason is that social media is a paradigm shift, just as the move to computer-based learning was a paradigm shift. And just as computers can no longer be dismissed as toys for playing shoot- ‘em-up games, social media can no longer be marginalized as just wasting time on Facebook and Twitter. Social media represents a whole new way of doing things not just for educators and their students, but society as a whole. It is for this fundamental reason that Foote, Jakes and Shareski advocate schools embracing social media. Like those who understood rock’n roll as a rebellion against the conformist 1950s, these educators know that social media is truly the wave of the future. Schools can either choose to get on top of the wave and surf with it, or be washed away as it crashes through the sea of society. Connect: You need to get connected to the right social media tool that works for you. Do the research, sign-up, or “lurk” a bit by spending some time “playing” with them. Start a free blog and invite people to join. Of course, Twitter, Facebook, Ning, Google + and Posterous are all great places to start, too. Collaborate: So many people connect to social media, but do not leverage the "social" aspect it offers. Let's say you join Twitter and just consume the information that is being shared. If you fail to contribute back to the community of people you are connected to, you will be missing out on some really valuable connections. By contributing you will also gain more followers that will in turn allow you to increase your connections and collect valuable resources. Curate: Now you have all of this information. What do you do with it? There are tools that allow you to sort things out and remain organized. By using free social media “dashboards” like Tweetdeck or HootSuite, you will be able to include multiple social media sites in one location that will allow you to both consume, contribute, and curate information. One of my favorite tools for digital curation is the social bookmarking site Diigo. You can link this service to your Twitter account, and the toolbar is great for quick bookmarking and note taking. Frank Pileiro is a Technology Coordinator in Southern New Jersey. Read his blog at techlearning.com and follow him on Twitter @MrP_LPS.